Glow-In-The-Dark Baseball! The Greatest Game Ever Played! The greatest game of baseball ever played happened while we were vacationing on the warm sandy beaches of California. We played in the waves and sand all day! As the hours passed we forgot to pull out our fat bat and wiffle balls! It wasn’t until the sun set, and we went to grab the glow sticks we had purchased for that night, that we noticed the untouched baseball supplies! In an effort to make our fun day at the beach last a little longer, my mom thought up the brilliant idea of stringing the glow stick bracelets through the wiffle ball holes so we could play in the dark! That night the Greatest Game of Baseball was born. We played for hours in the dark with the entire family! I have never had so much fun on the beach before. I am so excited to share this fun game that will be perfect for the upcoming summer nights! To get the game rolling break the glow sticks and shake them up. 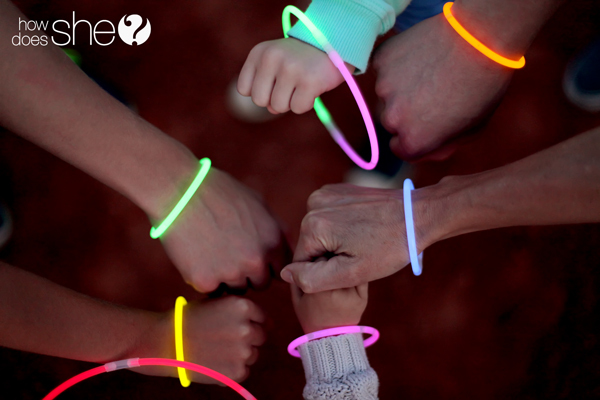 You can use 1 or 2 glow bracelets for each wiffle ball, depending on how bright you want them. Thread the bracelets through the holes and link the bracelet to itself. I like to push the bracelet link back through the the holes of the ball, so it sits inside, to keep it from coming undone during play! Use a glow ball which you just made or glow necklace for each of the four bases. This game can be played on a baseball diamond, a field, the beach, or any open area! Every player gets a glow bracelet, necklace, or both! You can choose to match colors by the teams, or everyone can use random colors. Typically a team would consist of at least 9 players. There is a Pitcher, Catcher, First, Second and Third Baseman, Short Stop (between second and third base) and 3 Outfielders. Most of the time we don’t have enough people to play every position, so we divide the teams equally and fill in the best that we can! The pitcher throws the ball to a member of the opposite team that is up to bat. Three strikes and you are out…. or….. you can swing until you hit it! 😉 We like to play that way when we have little ones on the team. When we play with my toddler we trade off being tagged with her to help her swing the bat and run the bases. Each player that makes it to the home base wins a point for their team! While running the bases you can be tagged out by any player of the opposite team holding the ball. You can make up your own rules for being tagged out as well! It is so fun to cheer on the little ones as they swing, hit the ball and sprint to first base! This is the perfect game for ALL ages, for any type of gathering from family reunions and night games with neighbors, to camping and trips to the beach! Glow sticks bring out the kid in all of us, and a friendly game of baseball is a great way to build team spirit! What are some of your favorite night games to play on warm summer nights? « Free Online Gym Membership Code!! I LOVE this idea!!! Can’t wait to try! This looks fun! We have also played glow in the dark mini golf. You have to fit the whole braclet in the golf ball. This is fun to play in the back yard on warm summer nights! We have even played this indoors on a cold winter night as well by making our own courses in the house. This is SO fun! I’m going to do this for a big family gathering this summer with my kids and all their cousins. I know it’ll be a hit! What a fun idea! We have some glow in the dark paint in the garage, maybe I’ll let the kiddos paint some wiffle ball bats! Just had to comment on this. I am Lara’s mom and anyone planning a trip to Disneyland should seriously consider spending an evening at Huntington Beach State Park. They had round fire pits to have a fire in and roast hotdogs and marshmallows. You can get fire wood at any of the local grocery stores but the best part is staying after it gets dark after the wind has died down. You will basically have the entire beach to yourselves as everyone else is around the fire pits. The beach is wide and a great place to play this glow in the dark baseball. It seriously is one of the funnest things we have done. Has anyone ever hit the glow stick so hard that it burst open? I am a little concerned about the chemicals in those things. This is so fun! I love it. This weekend at camping we played glow in the dark ring toss with the glow bracelets. It was as much fun for the adults as the kids. Buying the supplies today so my kids can play this with their cousins this weekend! !